Ok, I’ll listen to any nutritionist who tells me to eat chocolate in the afternoons, and Ashley is one of my favourite nutritionists (you can follow her on Twitter @AshOverholt). 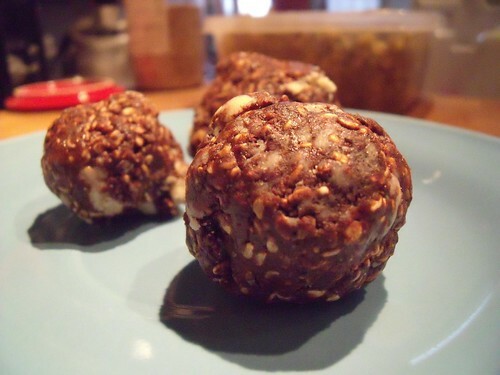 She gave me this recipe for energy-boosting tahini truffles, full of all sorts of good-for-you things! And they are supremely easy to make — stir, roll, chill, eat. Yes. There’s something about the crunch of the sesame seeds, the smoothness of the tahini and the richness of the chocolate that makes these so good and satisfying. I find that one in the middle of the day keeps me going through to dinnertime. And they’re a perfect dessert. Sweet, chocolatey, and actually good for you! 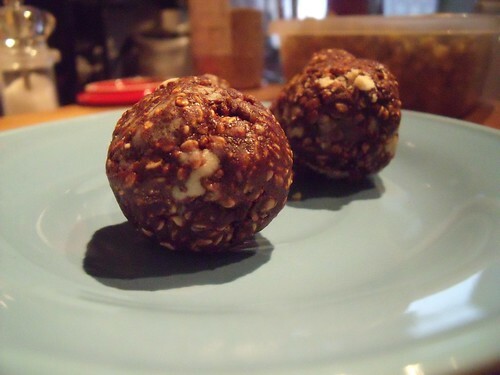 Feel free to add your favourite mix-ins: goji berries, nuts, toasted unsweetened coconut. And enjoy without guilt! Recipe courtesy of Ashley Overholt, Makes about 18 truffles. Roast sesame seeds in a dry pan on high, stirring constantly until they start to pop (after about 2 minutes). Transfer to a heat-proof bowl, and add the other ingredients. Mix well. Roll into small balls. Refrigerate any you haven’t already eaten by the time you’re done rolling… if you can make them last, they’ll be ok in the fridge for up to a week. This are amazing and simple! I am now just waiting for the chilling part but of course, licked my fingers! I don’t recommend using the Vitamix as it is overkill (so like me!) and you waste too much! I hope you love them!!! And thanks for the vitamix thoughts… this is a good time for a bowl and a spatula, I think.